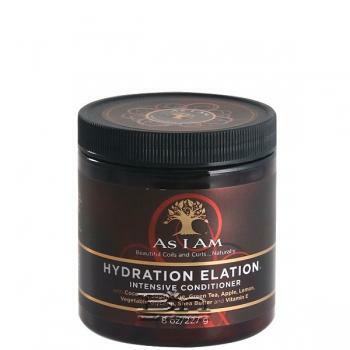 As I Am Hydration Elation Intensive Conditioner For deep moisturization, strengthening and repair. Scheduled maintenance with this deep-down hydrating and fortifying treatment is a must for strong, shiny, soft, springy coils and curls. This rich penetrating conditioner is an exceptional composition of extracts of coconut, sugar cane, green tea, apple and lemon, shea butter, vitamin E and proven hair fortifiers. Directions: First, cleanse your hair with one of the As I Am cleansers: Cleansing Pudding+ or Coconut CoWash. Distribute Hydration Elation throughout hair. Leave on 15 - 30 minutes, wearing a plastic cap. Optional: Allow conditioner to penetrate under a warm hood dryer for the deepest treatment. Remove cap, add a bit of water, and then carefully detangle hair.Rinse thoroughly.Treat your hair to an intensive conditioning treatment every 2 to 3 weeks (or even more frequently, depending upon the condition of your hair and what you do to it.